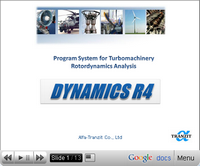 Solutions (presentations, examples, practical solutions), Alfa-Tranzit Co.
DYNAMICS R4 – the software package is specifically developed for design, analysis and trouble shooting of many kinds of rotating machinery. The objects of research – gas-turbine engines, power plants, air compressors, starters, turbo-expanders, turbo-driven pump assemblies, any kinds of gear systems, etc. It can be also used for development of model based diagnostic algorithms. 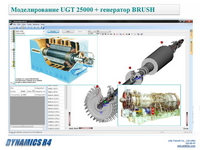 Using its forty-year experience in the field of rotor dynamics, the Alfa-Tranzit Ltd. company leads the engineering works on the orders of various companies engaged in manufacturing of different turbomachines. 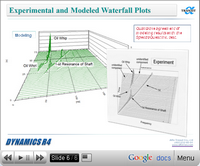 Using Dynamics R4 the company specialists simulate the subjects of inquiry, carry out their analysis and find a solution to an each particular problem. The solution presents the problems related to the use of the active magnetic bearings in rapidly rotated rotors of turbosets. The results of the dynamic analysis of the rotor supported by the active magnetic bearings are given. The possibility to control the rotor system changing the magnetic bearings stiffness and damping is considered. The behaviour of the rotor system during the rotor dropdown on the backup bearings and the following runout are investigated. Compressor and fan test stands are widely used in design and development of modern Gas Turbine Engines. The test procedures include wide ranges of operating speeds. This operating requires avoidance of the transmission rotor critical speeds. The problem may find its solution in the gearbox tuning or the elements replacement but this approach is expensive and time consuming. Also the wide range of speeds does not allow introduction of flexible damping supports because often the operating includes the both first and second critical speeds. The resulting vibrations hurt the facility reliability and life. 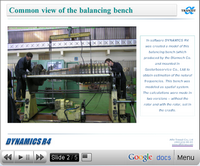 In software DYNAMICS R4 was created a model of this balancing bench (which produced by the Diamech Co. and mounted in Gasturboservice Co., Ltd) to obtain estimation of the natural frequencies. This bench was modeled as spatial system. The calculations were made in two versions – without the rotor and with the rotor, set in the cradle. 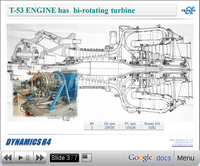 This work is a part of the performance and life enhancement of the T53 engine industrial application project. The simulating model provides numerical study of vibration response of the T53 engine incorporated in the Orenda Aerospace Corporation 1.2MWe power generator. Consideration of the rotors sliding changes the frequency spectrum for direct and reverse precessions. As far as the rotors rotations are of opposite directions the rotors unbalances consequently excite the resonance vibrations corresponding to frequencies of the both rotors. Oil whirl is a common problem with journal bearings used on machines equipped with pressure lubrication systems operating at relatively high speeds. If the shaft is moved off center due to load, eccentricity, or imbalance, then the clearance on one side of the bearing will be greater than that on the other side. As the lubricant rotates at less than 50% of shaft speed, it must squeeze through the narrow area where the shaft is closest to the bearing. The average speed of the lubricant increases inside the gap and slows down when it leaves the gap. Such a speeding up and slowing down process creates turbulence on both sides of the gap, and a vortex develops in the high-pressure lubricant zone. Laboratory plant was created to analyze dynamics of rotor on anisotropic (pendulum supports) supports (1975 Leontiev M.K.). 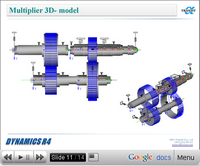 Rotor system is modeled as uniaxial. 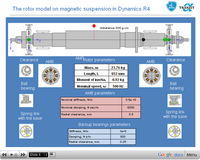 The Dynamics R4(2007 year) software allows creating a complete spatial rotor model with all elements of laboratory plant, calculating natural and critical frequencies, frequency response and showing precession orbits. Test stand modifications were supported by modeling of rotor structure. 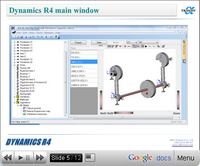 The rotor was modeled with the program Dynamics R4. This model includes just-listed units. Tested units - compressor, transmission shafts, intermediate support, additional support, мultiplier. It is a calculation example of the power generator on 5 elliptical bearings. Rotation speed is 3600 rpm. Initial model of the generator was built on beams, inertial elements and journal bearings which are modeled by flexible links. Using Xlpocket and XLTltpad nonsymmetrical stiffness and damping matrixes for all journal bearings (USA, Rotating Machinery Technology, Inc.) were calculated. Frequencies, mode shapes at 3600 rpm and stability maps was obtained. Critical speeds were calculated. The goal of this work are mathematic modeling of multiplier dynamic response which is used in the compressor stand assembly for AL55 engine. Research work was performed in the linear and nonlinear statement. Calculations in linear and nonlinear statement were carried out to determine natural frequencies and mode shapes of combined bending-torsional vibrations. Calculations at nonlinear transient statement allow to determine stability thresholds of the multiplier. 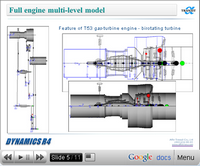 Multilevel model of two shafts gas turbine engine AL55 for study - training aircraft was created. Calculations of coaxial rotors were separately performed in two modifications: with case and without case. 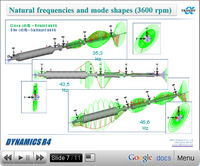 Frequencies and mode shapes, natural frequencies map, critical speeds were obtained. It is shown that taking into account a case changes the critical speeds spectrums. 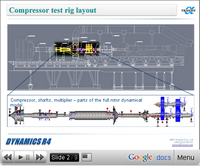 This work is a part of the performance and life enhancement of the T53 engine industrial application project. The simulating model in this stage provides numerical study of vibration response of the T53 engine incorporated in the Orenda Aerospace Corporation 1.2 MW power generator. The multilevel model includes three sub-systems (sub-models) - gas producer rotor (GP rotor), power turbine rotor (PT rotor) and case with mounting. Each sub-system includes a few smaller sub-systems. 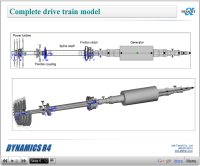 The model incorporates data of the engine layout, assembly and parts drawings, used materials performance, etc. Accuracy of the model was checked by matching the model mass and inertial data and by comparison of calculated critical speeds with the available test data. It is worth mentioning that the earlier analysis investigated the aero version of the engine differing with the industrial one by structures of the engine support and the front compressor support. Due to this difference the calculation results were not absolutely equal to the test data but the main performance of the sub-systems were in a good correspondence. calculation of forced oscillation under the influence of the distributed system of unbalances.